This must be the toughest question I ever ask when training managers as I rarely get any answers. If I push, I might get something along the lines of “bring in cakes” or “use the discretionary fund to give a bonus”. But that’s it! I usually fill a flip chart page, can’t keep up with the responses and there is a lot of shouting and talking over each other. So, why are managers so knowledgeable on this topic and not the other? Well, firstly they are talking about their managers, so they are in the Circle of Concern, which removes all accountability from them, and secondly, it is probably because their managers do a lot of the demotivating things! After a while, someone usually realises that if this type of behaviour demotivates them, it’s also likely that if, as a manager, they display the same types of behaviour, their staff will be demotivated too. So, how can a manager motivate their people? Yes, there are all the theories, but what are the simple, achievable actions and behaviours that impact on us? Make this meaningful and interactive, encourage questions, discuss the impact this may have on them in their role. What are their thoughts? When you meet your employees, remember to say “Good Morning” or “Hello” and ask how they are doing – it might seem obvious, but you’d be surprised how many managers don’t do this! Listen effectively – this is crucial! The big word, the answer to all our problems. 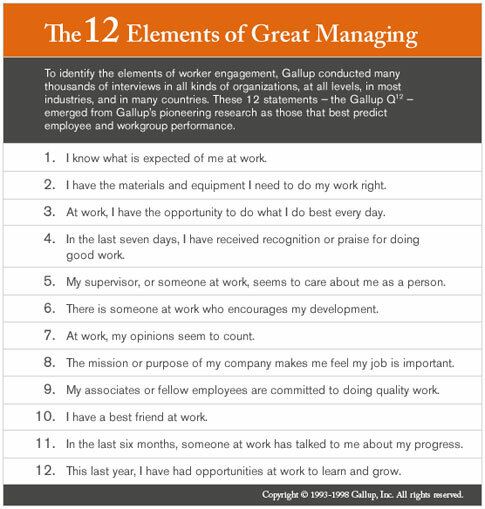 Gallup Inc. highlight the 12 elements of great management which are simple, key things any manager can do, in order to motivate their people. The 12 elements are taken from the Gallup Q12 Employee Engagement Survey. It is interesting to see that we are motivated by very simple and achievable things. There is nothing on that list that a manager cannot achieve, even number 10, having a best friend at work. As I’m sure you’ve noticed, there is nothing about cake on the list, but in my opinion cake will always make most people a little bit happier! Want to find out more about how to develop your managers to get the best from your people? Find out about our leadership and management programmes here.